You must use this voucher in its entirety during one purchase. Your Dogmatic gift voucher is transferable. It can be used by anyone who presents the code on the voucher. You cannot combine multiple Dogmatic vouchers when making a purchase. A Dogmatic gift voucher is the equivalent of a banknote. Do not lose it, as it cannot be replaced. 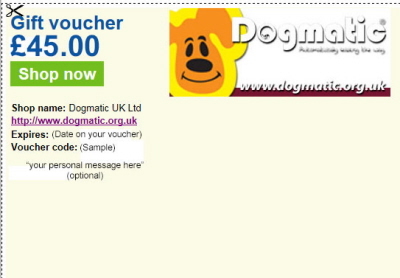 The use of Dogmatic gift voucher is subject to the terms and conditions published in the dogmatic.org.uk online shop listed on the voucher. Vouchers are delivered by email after payment completion. It will take longer if you pay by cheque. On receipt of the voucher, you can print it if you wish to make a present.